EUTELSAT’S TOOWAY™SATELLITE BROADBAND SELECTED FOR USE IN DEVON AND SOMERSET RURAL FAST BROADBAND SCHEME “THE RURAL CONNECTION”. Eutelsat Communications (Euronext Paris: ETL) today announced that the Tooway™ satellite broadband service provided by its Skylogic affiliate will be used in “The Rural Connection” project, run by Devon and Somerset County Councils, to bring high-speed Internet services to over 1,000 of the regions’ most rural homes and businesses. 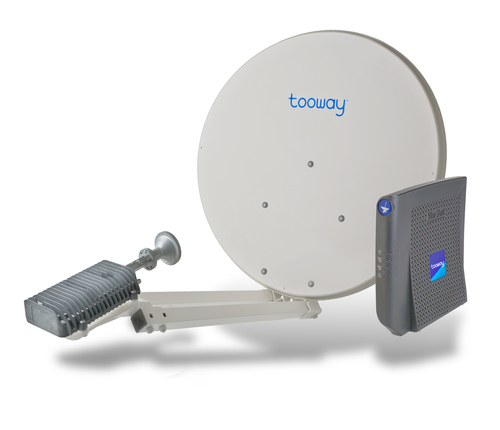 The service, delivered by specialist reseller partner, ToowayDirect, will connect residents and businesses to the Internet via a small satellite dish installed on the outside of the property. The £1m investment will enable free installation of the Tooway™ satellite broadband service for users who live in the qualifying area. Customers will have access to download speeds of up to 10 Mbps and upload speeds of up to 4 Mbps and a range of tariffs, together with a programme of free ICT training and support. Devon and Somerset County Councils won EU funding for the project from the European Rural Development Programme for England, which is being matched by the private sector. “The Rural Connection” project will significantly improve internet services to selected areas around the Devon and Somerset border that currently receive very slow or no broadband. Parts of the rural hinterlands of South Molton, Tiverton, Honiton, Cullompton and Axminster, together with Wheddon Cross on Exmoor, are covered. The project will run alongside the wider Connecting Devon and Somerset Programme, which aims to deliver superfast connectivity to at least 85% of homes and businesses and improved connectivity to all where the private sector has no plans to invest in the infrastructure. Devon’s Cabinet Member for Economy, Enterprise and Employment, Will Mumford, said: “Businesses across the county tell us that the number one requirement for them to develop and expand is faster and more reliable broadband. That’s why we are working with colleagues in Somerset to deliver this exciting rural broadband project ahead of the wider Connecting Devon and Somerset multi-million pound programme of investment. Somerset’s Cabinet Member for Strategic Planning and Economic Development, David Hall, said: “The project has been welcomed by the business community in the area and will include a range of business support activities to help enterprises fully benefit from improved connectivity. The new-generation Tooway™ service is delivered via Eutelsat’s innovative KA-SAT satellite, which entered commercial service in May 2011. With its total capacity of more than 70 Gbps, KA-SAT ushers in a new era of competitively-priced, satellite-delivered services for homes and small businesses across Europe and the Mediterranean Basin. The satellite forms the cornerstone of a new satellite infrastructure, which includes eight main satellite gateways across Europe connected to the Internet by a fibre backbone ring. ToowayDirect is the biggest Tooway™ distributor in the UK. From its base just north of Oxford, UK, ToowayDirect delivers the ground services that make Tooway™ satellite broadband achievable. Having invested in the latest online ordering, payment and support systems, ToowayDirect make the Tooway™ service accessible to end users, providing logistics, installation and maintenance services, and as well as delivering class leading customer and technical support. ToowayDirect offers these value added services across all the not-spots of Europe via a network of certified resellers and installers. Eutelsat Communications (Euronext Paris: ETL, ISIN code: FR0010221234) is the holding company of Eutelsat S.A.. With capacity commercialised on 29 satellites that provide coverage over the entire European continent, as well as the Middle East, Africa, India and significant parts of Asia and the Americas, Eutelsat is one of the world's three leading satellite operators in terms of revenues. As of 30 June 2011, Eutelsat’s satellites were broadcasting more than 3,800 television channels. More than 1,100 channels are broadcast via its HOT BIRD™ video neighbourhood at 13 degrees East alone which serves over 120 million cable and satellite homes in Europe, the Middle East and North Africa. The Group’s satellites also serve a wide range of fixed and mobile telecommunications services, TV contribution markets, corporate networks, and broadband markets for Internet Service Providers and for transport, maritime and in-flight markets. Eutelsat's broadband subsidiary, Skylogic, markets and operates access to high speed internet services through teleports in France and Italy that serve enterprises, local communities, government agencies and aid organisations in Europe, Africa, Asia and the Americas. Headquartered in Paris, Eutelsat and its subsidiaries employ just over 700 commercial, technical and operational professionals from 30 countries. This press release was distributed by ResponseSource Press Release Wire on behalf of The Amber Group in the following categories: Consumer Technology, Computing & Telecoms, for more information visit https://pressreleasewire.responsesource.com/about.